What is a Lifetime ISA, and is it right for you? The Lifetime ISA (LISA), announced in 2016, would prove to be one of George Osborne’s last flagship gestures to UK savers and investors as Chancellor, eventually launching against a backdrop of anti-climax a year later in April 2017. Why anti-climax, you may ask? That’s because the response by Britain’s banks and building societies has been dismal. Admittedly, the picture has improved somewhat since last summer, and there are now 12 providers who offer a LISA. However, just three of these offer cash versions of this ISA type, so the pickings remain slim for ordinary savers. 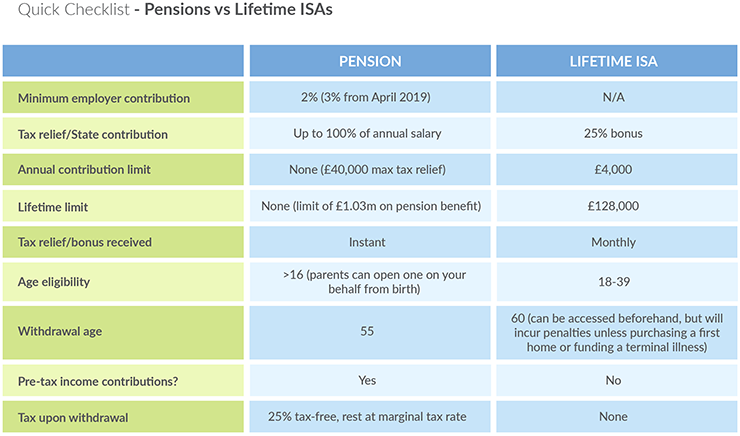 Nevertheless, poor uptake among providers does not necessarily mean the product itself is poor, so it’s well worth learning more about Lifetime ISAs to establish if they could be a suitable replacement (or supplement) to a pension. A Lifetime ISA is an account which has a built-in bonus scheme, whereby every £4 saved earns an additional £1 sponsored by the Government. You can put away up to £4,000 per year, which equates to a maximum annual bonus of £1,000. Anyone between the ages of 18-40 can open one, but you can subscribe to it until you turn 50, which means you could theoretically earn up to £33,000 of ‘free money’ (if you were born before 6th April, otherwise £32,000). The bonus structure is similar to that of the Help-to-Buy (H2B) ISA, which will no longer be available from November 2019. And, like the H2B ISA, it is geared towards helping those saving for a first home. There is a heavy penalty if you withdraw from your LISA before the age of 60 (25 per cent of the withdrawal amount, plus loss of interest), but one of the exemptions is for first-time buyers, who can cash out to purchase a home valued at up to £450,000 without forfeiting their bonus. The only other withdrawal exemption is to fund the cost of a terminal illness that leaves you with less than 12 months to live. Government has been clear from the outset that the Lifetime ISA is not intended as a substitute for a pension, and the reality is that a pension will still be the best option for most working people. For starters, under auto-enrolment rules, employees are entitled to receive a minimum of 3 per cent of their salary in employer contributions from April 2019, and many schemes are even more generous. This is effectively free money, and therefore hard to turn down. And, unlike payments into an ISA, pension contributions are made on pre-tax income (a benefit known as pension tax relief), and it applies to both workplace pensions and SIPPs. There was talk of it being cut at last year’s Budget, and the rules may yet change in the future. But, for now, pension tax relief is a supremely efficient way of building up your retirement pot. Not only that, but for those who currently fall within the higher-rate tax bracket, but expect to become basic-rate taxpayers in retirement, the gains are even more stark. That’s because, in contrast to ISAs, pensions are subject to income tax upon withdrawal, so it’s very important to consider your circumstances beyond the age of 55, and once you stop working. What are the limits for Lifetime ISA contributions? As with any other form of ISA, any subscriptions you make to a Lifetime ISA will count towards your annual ISA allowance – currently set at £20,000 for the 2018/19 tax year, remaining unchanged for 2019/20. Also, you can only subscribe to one ISA within each ISA category per year. The effective lifetime limit for contributions to a LISA is £128,000 (ie: £4,000 per year, between the ages of 18-50). On the other hand, you can benefit from tax relief on pension contributions up to £40,000 per annum. And for those who want to keep boosting their retirement pots beyond the age of 50, the lifetime limit for pension benefit on contributions is a generous £1.03m (£1.055m from April 2019), and it therefore compares favourably to a LISA in this respect. When do I receive my government bonus? The bonus is paid monthly. You do not need to take any action to claim the bonus – instead, your Lifetime ISA manager will claim it from HMRC, and credit it to your account accordingly. Bonus payments will be eligible to earn interest once they reach your Lifetime ISA, and you are free to invest them within a stocks & shares LISA. Please note: the bonus is calculated purely on contributions, and is not affected by interest gains or investment growth. So, even if your investment value diminishes, you will still receive the bonus on what you paid in (the converse is true too). Can I earn the bonus on transfers from another ISA type? Some good news here: the answer is yes. If you transfer from a previous year’s cash, stocks & shares or Innovative Finance ISA, the money will not only be eligible for the bonus, but also won’t count towards your annual ISA allowance. The transfer will, however, count as a contribution towards your annual £4,000 LISA limit, and £4,000 is therefore the maximum you can transfer in a given financial year. What is the process for using Lifetime ISA money to buy a first home? The process will vary between Lifetime ISA providers, but usually it should be a simple case of notifying them via secure message within your account. Unlike the H2B ISA, your bonus can also be used towards your exchange deposit. Please note: while you are able to hold both an H2B ISA and a LISA, you can only use the bonus from one of them towards the purchasing of a first home. Can I open a joint Lifetime ISA? Those interested in buying a first home together may want to pool their savings into the same LISA. However, at present, there is no form of joint LISA. That said, there is nothing stopping partners or spouses from opening LISAs of their own, and then using those funds to purchase a property together. In fact, through this mechanism, you can effectively double the scope for bonus earnings. Even if your partner/spouse owns, or has previously owned, a property, there is still nothing stopping you as a first-time buyer from opening a LISA and putting it towards an exchange deposit. Is a Lifetime ISA more suited to younger people? Those of a younger disposition will be afforded more time to maximise the generous state bonus on offer. Perhaps hand-in-hand with that, those looking to purchase a first home can effectively kill two birds with one stone via the LISA – save towards retirement, and cash out a chunk of the balance (including the bonus amount) at any point to put down a deposit on a first home. For many young people today, saving for a first home and saving for a pension can feel like mutually exclusive objectives. It’s gap which the LISA bridges quite nicely. Can the Lifetime ISA help the self-employed save for retirement? Under pensions auto-enrolment, employees should be receiving workplace pension contributions from an employer. But, if you are self-employed, or if you’ve opted out, then the bonus money available through the Lifetime ISA could provide a useful alternative to help build up a retirement pot. The double benefit of a pension is the ‘free money’ that comes courtesy of employer contributions, and also deducting personal contributions prior to income being taxed. However, if the former is not something at your disposal, then the benefits of the Lifetime ISA, courtesy of the bonus structure and the ability to withdraw tax-free after turning 60, could come up trumps. As mentioned above, although you can withdraw from a LISA at any time, there can be punitive penalties for doing so, and the bonus earned on that amount of money will be negated. That said, past the age of 60, you are free to withdraw from your LISA as you wish, with no tax incurred. Pensions, on the other hand, do not usually have a mechanism for withdrawal until the individual reaches the age of 55. Until recently, there was limited flexibility as to how a pension could be withdrawn too, with most people obliged to annuitise their pension pots in retirement. However, in April 2015, the so-called pension freedoms came into being, meaning that over 55s can now treat their pension pots as cash if they choose, and withdraw as often as they please. Many of those in retirement choose to invest some or all of their pot, and/or buy an annuity. But pensions have become all the more attractive by virtue of the fact that over 55s can now make withdrawals at will, with the first 25 per cent of the amount being tax-free, and the remaining 75 per cent subject to the individual’s marginal rate of tax. So is a pension a better choice for me than a Lifetime ISA? For most people, it would be ill-advised to sacrifice saving into a pension in favour of a LISA. There will, of course, be many exceptions, such as the self-employed and prospective first-time buyers. But, more often than not, the combination of tax relief and employer contributions will overwhelm the level of the bonus that can be accrued in a Lifetime ISA - even for basic-rate taxpayers. It’s also worth noting that the present rates of interest paid on cash Lifetime ISAs are poor, currently with a leading rate of 1.10 per cent AER. Those who opt for a stocks & shares alternative could see more significant growth, but – aside from the fact that the level of investments can go up or down – there are typically fees and charges to contend with. In short, the Lifetime ISA certainly has its place in UK personal finance, and could be ideal if it suits your individual situation. Indeed, despite the limited number of providers, over 100,000 customers opened a LISA within its first year of launch. But its overall merits, generally speaking, don’t quite live up to the hype that followed its announcement back at the spring Budget of 2016.